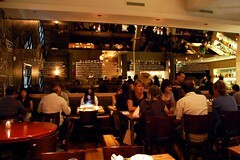 On Saturday night, I was the only person at our table who hadn't already been to Picca Peruvian Cantina. My two favorite people in the world (Mr. Monkey and Brother Monkey) and one of my most trusted friends with good taste (insomniac) had all visited before, and all three of them raved about it. 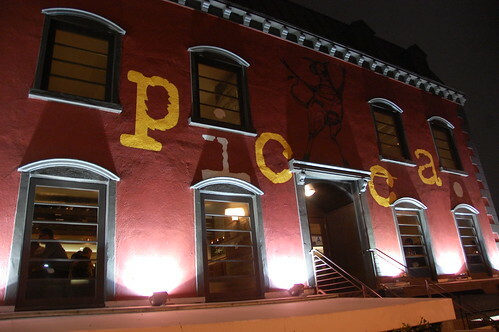 Could Picca live up to my high expectations? 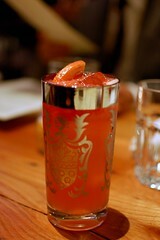 Picca's drinks can't be beat! You must order one when you come! 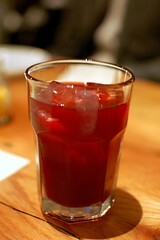 (1) Chicha morada -- non-alcoholic purple corn tea ($3). (2) Martin Ricky -- lime juice, grapefruit juice, simple syrup, two dashes Peychaud bitters, Pisco, whip, soda poured over ice in Collins, topped with strawberry air ($11). 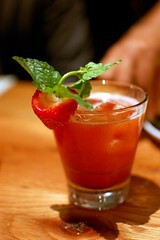 (3) Everything Nice -- cachaça, fresh muddled strawberries, fresh lime juice, honey, cinnamon sugar, peach bitters, garnished with strawberry and mint sprig ($12). 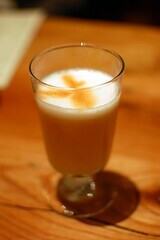 (4) All Saints Fizz -- Venezuelan rum, Pisco, fresh lemon juice, evaporated cane sugar, frankincense tinture, soda ($11). I got the Martin Ricky. It was stunning. I would like to drink the whole cocktail menu. 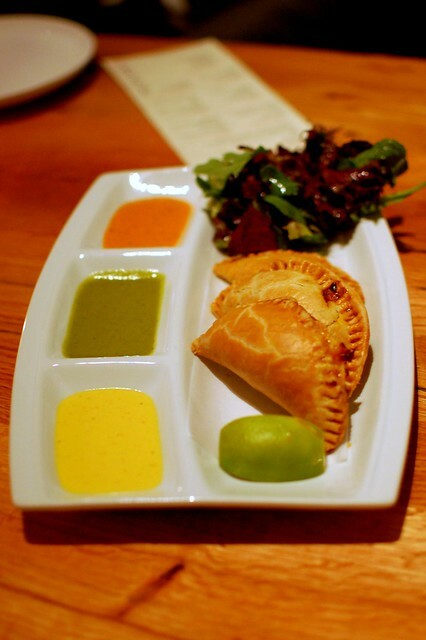 Empanada trio -- beef, chicken, eggplant, salad ($9). Tremendously flaky yet not dry. Quite the palate-pleasing pockets! 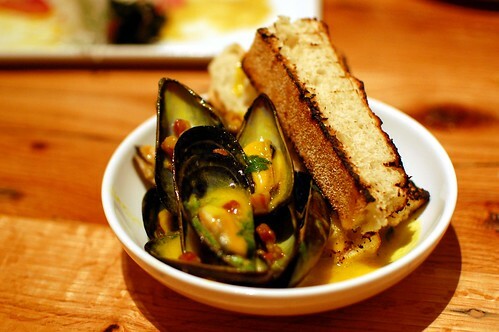 Choritos -- steamed mussels, pancetta, aji amarillo butter ($11). As good as everybody says they are. The pancetta is in cute, crunchy cube form. The sauce is superb. We were all fighting for the bread to sop it all up. 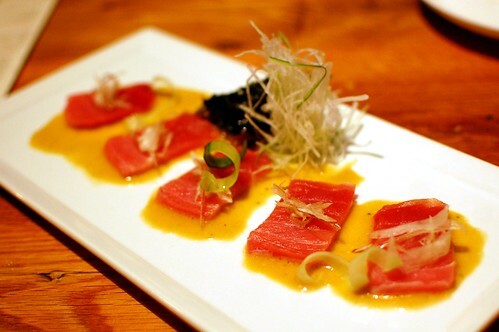 Toro tiradito special -- thinly sliced fatty tuna, soy ceviche dressing ($30). Lovely fresh little bites. Had we known the steep price, however, we probably would've opted for either the seabass or the regular tuna version for just $12. 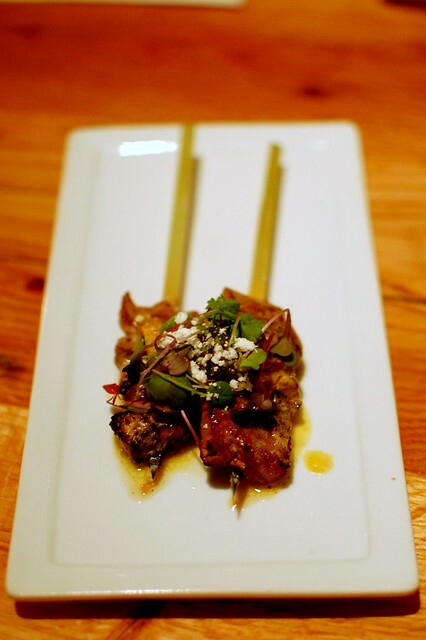 Beef filet anticuchos -- sea urchin butter, garlic chip ($9). Mr. Monkey had these the last time he visited and specially requested them again. Do you love steak? Do you love garlic? Do you love eating food on sticks? Then here are the skewers of your dreams. 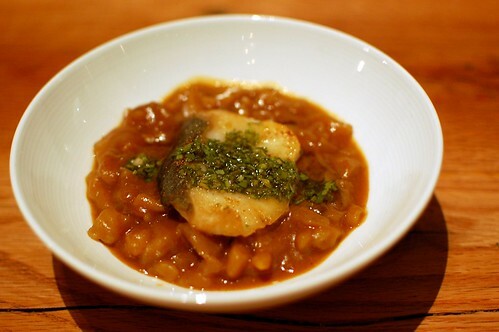 Carapulcra -- roasted black cod, Peruvian sun-dried potato stew, chimichurri ($13). Smooth and mild with a bit of smokiness. The cod was so delicate. 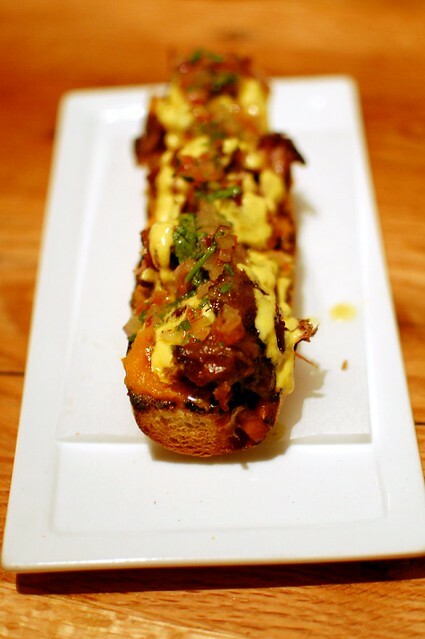 Chicharron de costillas -- crispy pork ribs crostini, sweet potato puree, feta cheese sauce, salsa criolla ($9). The best open-faced piggy sandwich you'll ever have. Pollo saltado special -- chicken, salsa criolla ($12). Tasty but not particularly interesting. Probably wouldn't get this again. 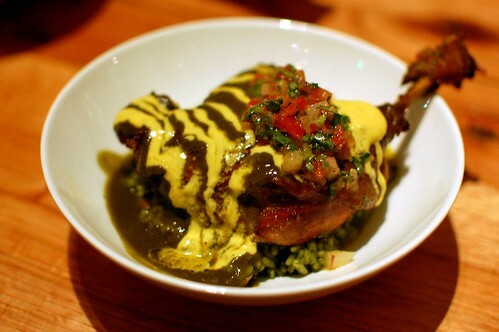 Seco de pato -- duck leg confit, black beer sauce, cilantro rice ($14). Loved! The duck fell off the bone and melted in my mouth. The rice was a tad too salty, though. The one sure thing at Picca is that none of your dishes will be bland! 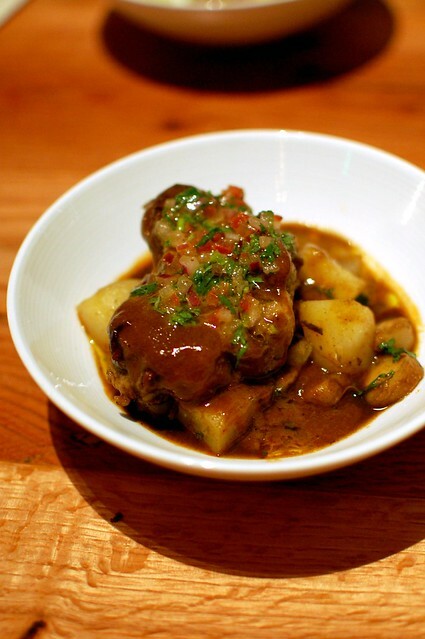 Chanfainita -- braised oxtail, mote and potato stew ($12). Somewhat reminiscent of my favorite dish at Chef Ricardo Zarate's casual food court eatery, Mo-Chica. My heart still belongs to that rich oxtail risotto, but this dish was a strong meaty offering. Stuffed with custard and accompanied by caramel, marmalade, and chocolate. 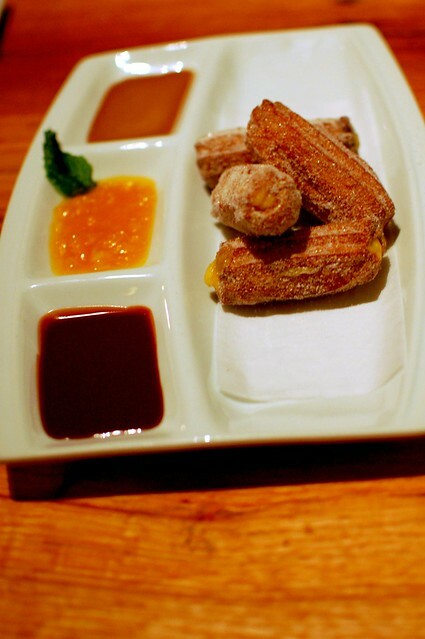 Really, who doesn't like churros? People with no souls, that's who. 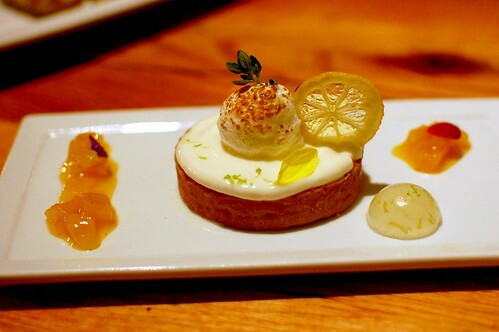 I thought this tasted more lime-y than lemony, and that was totally fine by me. Some dishes certainly shine more than others, but, out of a collective six meals eaten by the members of our party, there have been no misses. 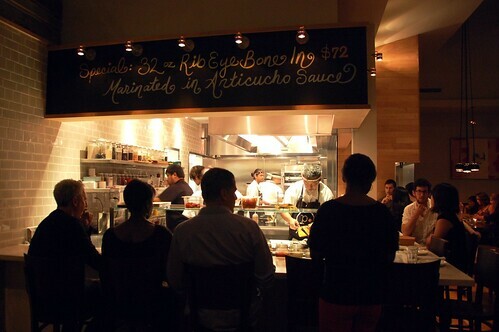 You shouldn't miss this place. Go. Hah, so I'm not the only one that thinks of Pokemon when I think of this name. Picca ROCKS! Glad you loved it too! 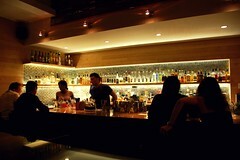 Oh man, this place looks divine! I will be dreaming about those churros tonight. everything looks delicious. 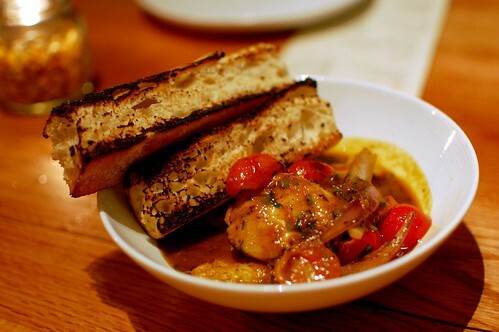 I want to slurp on those mussels right now. oxtail! it's funny how saltados are usually not so good at fancier peruvian places, but it's sometimes the only acceptable thing to get at the holes in the wall. Dang, I still have not gone here! It looks delicious! Clever title. I also love that bright red color. So stoked you posted this cuz I haven't seen too many Peruvian restaurants. For this, I'll leave my South Bay bubble!